For a contribution of as little as £5 per month, you can join the Hospice Lottery to put yourself in with a chance of winning a top cash prize. That could be enough to buy a new pair of shoes, pay your utility bills for the year or take yourself and your family off on holiday. 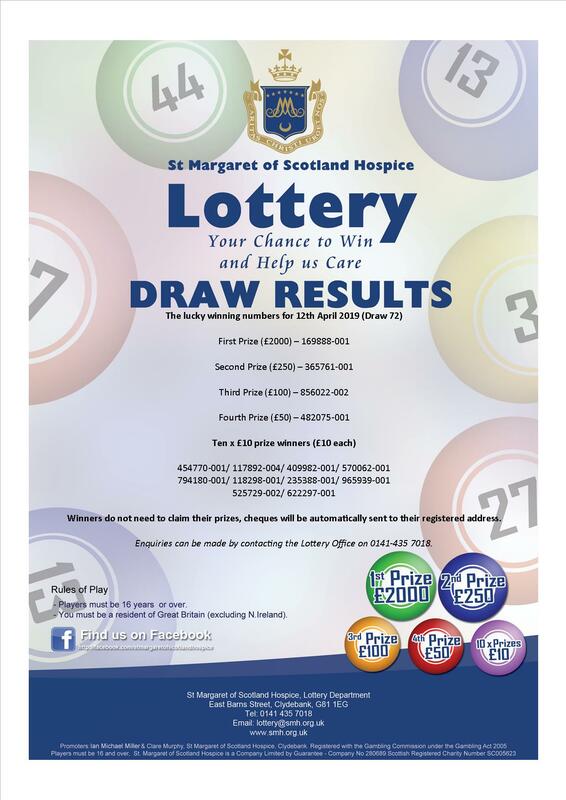 Hospice Chief Executive Sister Rita says: “By joining the St Margaret of Scotland Hospice Monthly Lottery, members will be helping us to care and support local people in their own community. “Entering our monthly lottery is a great way to support the Hospice and help us to maintain the highest standards of care. We depend very much on the generosity of our friends within the community who support our events and fundraising campaigns.” Sign up today by contacting the Lottery Office on 0141 435 7018 or by filling out the form below. Full terms and conditions can be obtained by contacting the hospice and can also be downloaded here. Registered with the Gambling Commission under the Gambling Act 2005. Players must be 16 and over. You must be a resident of Great Britain (excluding N Ireland). St Margaret of Scotland Hospice is a Company Limited by Guarantee – Company No 280689. Scottish Registered Charity Number SC005623.